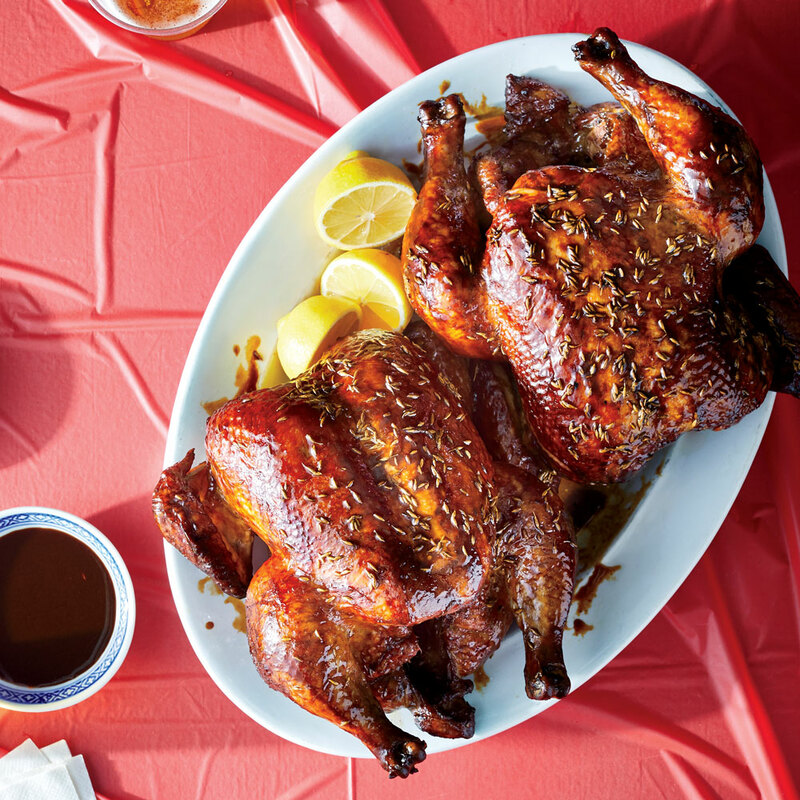 This roasted-on-the-grill chicken recipe is inspired by weng yao ji, or clay oven–roasted chicken, a specialty of Nantou County, Taiwan. Taiwan’s clay-oven chicken is traditionally suspended in a cylindrical oven as it roasts. It’s then torn into juicy pieces by hand and served with drippings for dipping and lemons for squeezing over the smoky meat. To approximate the clay-oven cooking method, use a kamado-style charcoal grill, like a Big Green Egg, and a vertical chicken roaster, like the HIC Vertical Chicken Roaster ($11, amazon.com). You can also roast the birds in a 250°F oven with the vertical roasters set in a 9- x 13-inch pan and the oven rack in the bottom third of the oven. Place shiitakes and peppercorns in an 8-quart stockpot over medium, and cook, stirring often, until fragrant and peppercorns start to pop, about 8 minutes. Add soy sauce, Shaoxing, soy paste, tea, ginger, salt, 4 cups water, 1/2 cup garlic cloves, and 2 teaspoons cumin seeds to pot; bring to a boil over high. Reduce heat to medium-low, and simmer, uncovered, until flavors are infused, about 30 minutes. Remove pot from heat, and add scallions. Add ice; let stand, stirring occasionally, until ice is melted. Submerge chickens in brine, weighing them down if needed. Cover and chill at least 2 hours or up to overnight. Remove chickens from brine, scraping off any solids stuck to skin, and set chickens aside. Pour 2 cups brine through a fine wire-mesh strainer into a small saucepan; discard solids and remaining brine. Bring reserved brine to a boil over medium, and cook until reduced to about 1/2 cup, about 20 minutes. Open vents of a kamado-style grill completely. Light 2 charcoal chimney starters filled with lump charcoal. When charcoal is covered with gray ash, pour on grill’s fire grate. Insert cooking grate; close grill lid, and bring internal temperature to 250°F to 275°F. Maintain temperature 10 to 15 minutes. Tuck wings under chickens. Place chickens, wing ends up, on vertical roasters with drip pans removed. Place roasters in a 16- x 12-inch aluminum roasting pan with handles; fill pan with remaining 5 cups water and remaining 1/4 cup garlic cloves. Brush chickens with 1/4 cup reduced brine, allowing excess to drip into pan. Transfer pan to center of grill. Close grill lid, and smoke, basting with pan drippings and remaining 1/4 cup reduced brine every 30 minutes, until a thermometer inserted in thickest portion registers 150°F, 1 hour and 30 minutes to 2 hours. Brush chickens with pan drippings, and sprinkle breasts with remaining 2 teaspoons cumin seeds, pressing to adhere. Close grill lid, and continue smoking until skin is golden brown and a thermometer inserted in thickest portion of thigh and breast registers 160°F, 30 to 45 more minutes. Remove chickens from grill; let rest on roasters until thermometer registers 165°F, about 15 minutes. Transfer chickens to a serving platter. Garnish with lemon halves, and serve with pan drippings.